The four principal elements of music are melody, harmony, rhythm, and orchestration. Of these four, melody is indisputably the most important. It is the essence, the soul of music. And, as I shall show later…melody is connected with the human voice, from which it stems. 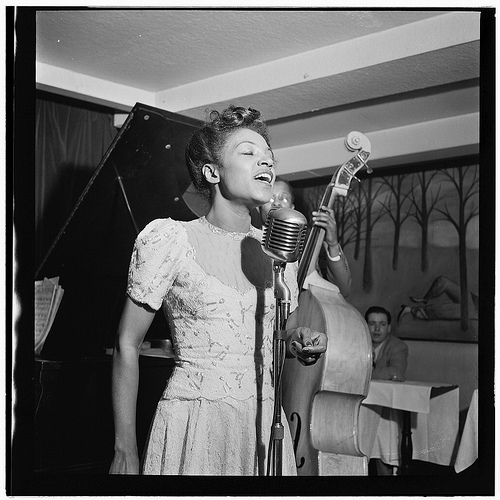 Maxine Sullivan, Village Vanguard 1947. William P. Gottlieb [Public domain], via Wikimedia Commons. Maxine Sullivan was one of those singers who had all the hallmarks of a jazz singer – perfect pitch, impeccable sense of rhythm, easy and relaxed manner, an ability to float effortlessly over the chord changes of a song. Listen to her renditions of Blue Skies (Berlin), Easy to Love (Porter), and Folks on the Hill (Kern, Hammerstein III). The jazz singer fits a jazz group like a hand in a glove. She surrounded herself with great musicians who brought out the best in her singing, and she complimented them just as much with her melodious, beautiful interpretations of well-crafted songs. In the setting of the Claude Thornhill Orchestra or the Thornhill small band her voice was another instrument, and to a great extent, the most important voice in the band. George Gershwin died just as the swing era, and Maxine Sullivan’s career was getting underway, and so he never got a chance to hear Maxine Sullivan sing Nice Work If You Can Get It recorded in New York in 1937 with Charlie Shavers (trumpet) and Buster Bailey (clarinet). He would have appreciated it! Because jazz singers possess perfect pitch and an impeccable sense of rhythm they can initiate a song with only the outline of the harmony being played. All the pianist has to do is hit the first note and the singer is off. Sometimes the singer actually sets the rhythm for the combo and the musicians follow her lead. This is certainly true in Lee Wiley’s rendition of Manhattan (Rodgers-Hart). The singer is the soloist just as when a saxophone player is backed by a combo. Unlike the instrumentalist, however, the singer conveys the meaning of the song by being able to sing the actual words. Great instrumentalists convey feeling through their playing, but the jazz singer is able to do this as well and, in addition, to sing the lyric (which is often as well-crafted as the melody of the song.) Lee Wiley’s versions of I’ve Got a Crush on You (G.Gershwin-I.Gershwin), (I Don’t Stand a) Ghost of a Chance (with You)(Crosby-Washington-Young) and so many other classics are among the best renditions ever recorded. Her vocalizations blend seamlessly with the instrumentalists: Joe Bushkin (piano), Bobby Hackett (muted trumpet). A big band era singer who made a successful transition to the recording studio after the end of Big Band Era was Al Hibbler. Although he had only one hit single with Duke Ellington’s band (Don’t Get Around Anymore), he had several big successes in the 1950’s with studio bands. His baritone voice is immediately recognizable and his inflections and use of pauses and idiosyncratic phrasing resembled the characteristics of big band horn players. He recorded for both Verve and Decca, big labels, and he always had great studio bands to accompany him. His version of the Les Brown classic ‘Tis Autumn (Henry Nemo) is perhaps more memorable than the original because his vocal solo is the perfect match for tenor sax soloist (likely Al Klink). This is a jazz singer’s version of the song. The strength and full range of his voice opens up the song as effectively as the featured soloist of the band. 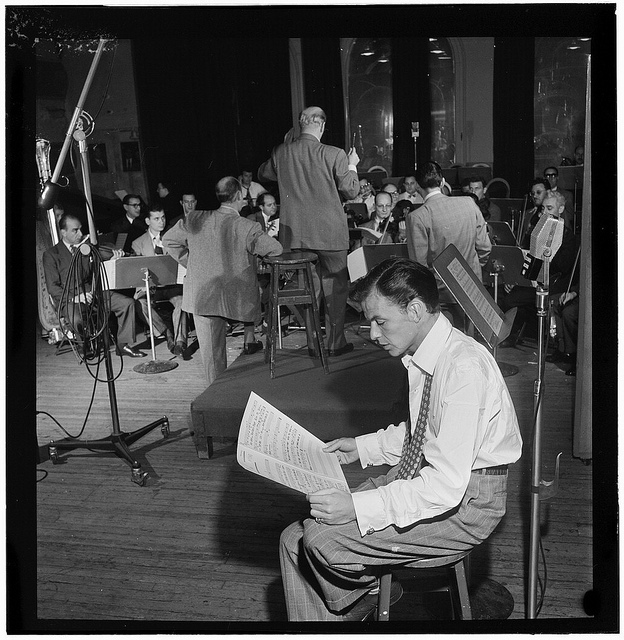 In the big band era, on occasion, the featured soloist of the band was the singer. Tommy Dorsey was one of the greatest trombone artists of all time, but when he completed the opening section of the Jimmy van Heusen song Imagination, Frank Sinatra took over the vocal. His vocal is the perfect match for the perfect trombone solo. It is a continuation of the sonority and shimmering beauty of the band leader’s trombone solo. One of the hallmarks of Sinatra’s style of singing, as both Will Friedwald and and Pete Welding have pointed out, is Sinatra’s hornlike phrasing wherein the singer creates elongated phrases much as a stellar trombonist , saxophone player, or trumpeter plays with a band. His voice becomes another soloist – and, as such, he compels us to be spellbound by his creations. Other big band singers who merely stepped up to the mike and sang the lyrics straight were fine and acceptable, but their delivery wasn’t memorable or compelling. The singers with the vocal uniqueness, undisputed command of technique, instrumental sophistication quickly rose to the level of being a major jazz soloist. The first female vocalist to demonstrate these qualities was, of course, Billie Holiday. It was her singing that created the template for all jazz singers to follow and exemplify. Small classics such as These Foolish Things, Them There Eyes, I Can’t Give You Anything But Love, When You’re Smiling, If Dreams Come True displayed the chief characteristics of a singer who wants to interpret a popular song with a jazz sensibility – utilizing rhythmic displacement, subtle changes in intonation, vocal shading, and respectful acknowledgement of a song’s lyric and the meaning of the words. Whether she sang with a big band such as Count Basie’s, Artie Shaw’s, or Teddy Wilson’s or a small ensemble (the classic 1952-55 Verve Recordings) she made her vocals shine with fresh originality, swing, and gentle shadings of harmony, melody and rhythm. Billie Holiday always acknowledged Louis Armstrong as the source of her inspiration in singing and how to interpret a lyric, and all of her work is essentially a tribute to her mentor. Because she had such a good ear for melody and harmony, and such a keen sense of rhythmic subtlety, she fit in with all the great jazz soloists of her era and sang “in the pocket” of each arrangement. The world of popular song interpretation and jazz vocals owes Billie Holiday a debt that can never be repaid, but the best jazz singers try every time they stand before the microphone. 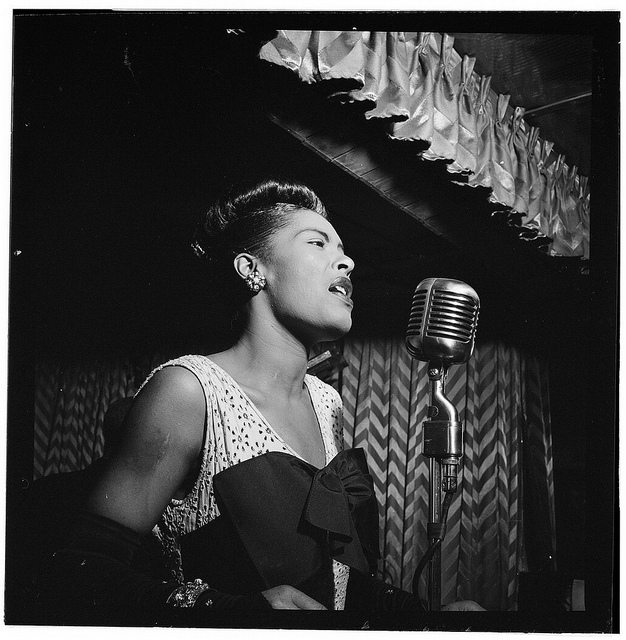 Singers such as Billie Holiday, Maxine Sullivan, and Lee Wiley could vary each performance of a song because they knew precisely where they were and where they were going in a song. They can enter a refrain a half-step away from the chord tone or enter a chorus just ahead or behind the beat because, with complete assurance, they will soon be exactly on the beat and hitting all the melody notes perfectly. Pop singers can’t do this, and opera singers when they attempt to sing jazz fail miserably. Because the jazz singer can vary each nuance of a song she can keep a song fresh each time it is performed. And the audience loves this and welcomes it. The jazz singer also keeps the music fresh for the musicians she is playing with as well. The bass player and the drummer don’t have to hear the same song sang the same way each night – how boring that would be! The singer is, in fact, doing what any good accompanist (usually piano, sometimes guitar) also does by freshening up the harmony and rhythm as she sings. Arguments that Billie Holiday was ‘past her prime’ in the 1950s are defeated by what may be the single finest recording of her entire career, her rendition of You Go To My Head (Gilespie-Coots) accompanied by the great Oscar Peterson Quartet (Peterson, piano; Barney Kessel (guitar); Ray Brown (bass); Alvin Stoller (drums) and the addition of the melodic tenor saxophone stylist, Flip Phillips, and the sensitive, always creative trumpeter, Charlie Shavers. Billie’s smoky voice is as intoxicating as the lyrics. Her timing and phrasing are unforgettable – she makes this single song a classic of cabaret singing. It is the standard that very few artists were ever to reach. Recorded in Los Angeles in 1952 You Go To My Head and other classic song interpretations by Billie Holiday for the Norman Granz Verve Label astonished many female singers of the era, and inspired so many established and yet-to-be-established female artists. Two singers, in particular, soon released albums that were deeply indebted to Billie’s Verve recordings: Anita O’Day and Peggy Lee. They recorded these albums using very small combos backing them, and they chose smaller, less well known songs to sing in the manner of Lady Day. In the years that followed, their careers took them to much bigger projects, but both Anita and Peggy felt that their own finest work was when they went into the studio determined to record small, intimate renditions of memorable songs with sensitive and melodic accompaniment. And the critics have agreed. 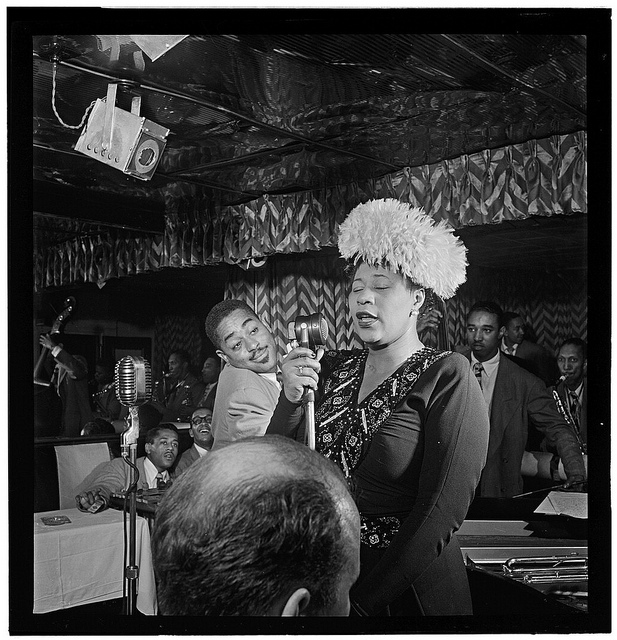 Ella Fitzgerald is renowned for her up tempo vocal excursions of swing songs, but her ability to sing jazz also served her well for being able to convey a lyric with conviction and subtlety. Her performances of the various Song Books for Verve (Harold Alden, Jerome Kern, Irving Berlin, George and Ira Gershwin, Rodgers and Hart, Cole Porter) have set a very high standard for vocal and lyrical perfection. Whether it is Gershwin’s immortal Embraceable You or the Rodgers and Hart classics My Romance and There’s a Small Hotel, her intonation, sense of phrasing, and total commitment to the meaning of the lyrics melds all the elements of vocal artistry. Ella Fitzgerald is one of a small number of singers who is able to sing the verse introduction to a standard with any skill and conviction. She makes these introductions shine. And then, of course, there is the magnificent Duke Ellington Song Books (also part of the series) and this is where her jazz sensibilities put her interpretations apart from all the rest. The Ellington Band had many legendary singers to record the band’s popular songs, but Ella Fitzgerald and the band created classic interpretations for all time. Ella doesn’t sing as someone extra added to the band as a vocalist. She is another, integral, part of the band the vocal expression of the Ellington Orchestra and a soloist on a par with the other acclaimed members of the band. Lastly, one only needs to hear Ella Fitzgerald singing It’s Only a Paper Moon (Harold Arlen) with the Billy May Orchestra to understand how great a jazz singer she is on an up tempo jazz standard. Her Harold Arlen Songbook with Billy May is the equivalent of Frank Sinatra’s best work on Capitol – roughly recorded at the same time. On It’s Only a Paper Moon, Ella displays all the earmarks of a quality jazz performance. She is totally in sync with the rhythm section throughout the entire piece, and this allows her to play with the melody and harmonies of the song at her discretion. When she returns to the song after the tenor saxophone solo, she creates all the right tonal colors from the melody and plays with the rhythm in the manner of a true jazz soloist. Sometimes, because the jazz singer is so skillful, the conductor/arranger writes and conducts charts that offer the singer/soloist little or no harmonic/melodic support. Listening to Anita O’Day sing Love for Sale and I Get a Kick Out of You from the album Anita O’Day Swings Cole Porter with Billy May (Verve) is like watching a tightrope walker crossing between two skyscrapers without a net. On Love May has charted a rhythmic riff for the band which supplies virtually no harmony; perhaps his feeling was ‘you’re a jazz singer…figure it out.’ On the second song, the tune proceeds at an insanely fast pace which leaves the singer no places to catch her breath. Billy May conducted many of the great singing legends of the period, people like Frank Sinatra and Ella Fitzgerald, and his band had top notch soloists so he basically threw caution to the wind and left the singer to fare on her own. Anita O’Day describes quite honestly some of her difficulties working in the recording studio in her autobiography. She is also frank about arrangers and conductors who wrote impossibly difficult charts. Nevertheless, her Verve recordings are legendary and contain marvelous interpretations of jazz standards. The singer did have the ability to sing under stressful circumstances and she shows a lot of grit for being part of these fabulous recordings. The O’Day Verve records demonstrate another characteristic of great jazz singers – the ability to be a major soloist in the context of awesome talent. The jazz singer must be able to solo like any other member of a stellar ensemble – no excuses, you either cut it or you don’t. No special treatment for the singer. It’s a sink or swim situation! Singer, Chris Connor, exemplifies another essential characteristic of the jazz singer. In her rendition of A Foggy Day (Gershwin) she uses her voice like a tenor saxophone. She produces a full, round, resonate and breathy tone as she sings the words to Gershwin’s beautiful ballad. If she were a saxophone soloist she would be in the school of Lester Young and Ben Webster or Stan Getz. These soloists played with little or no vibrato and the sound they produced through their horn was exquisite, especially on ballads. The other quality Chris Connor exemplifies is that type of saxophone phrasing where the length of the notes and the anticipation of each phrase are delicately sculpted to fit the melody. Popular song singers just don’t think this way, but jazz musicians do. Effortless ensemble singing with stellar musicians. Recognizable voice and unique sense of phrasing. Ability to use the voice as an instrument. Ability to sing the lyrics of a song in a completely heartfelt way. Ability to vary the characteristics of tone, again, much as a jazz musician is able to do with his horn. The purpose of this essay has been to stimulate a discussion and challenge some assumptions people may have about what is Jazz Singing. This essay is not intended to be a list of the top jazz singers of all time (that list would be too large), and everyone has their own personal preferences. Rather, this discussion has tried to elucidate what are some of the basic and essential characteristics of jazz singing as demonstrated in a few select song choices. Now, what are your preferences and choices? Enjoy! Russo, William: Jazz Composition and Orchestration. The University of Chicago Press. Chicago and London, 1968 and 1974 (Phoenix Edition), p. 2. Maxine Sullivan: It’s Wonderful. Affinity: The Swingtime CD Collection, Charly Records Limited. Pittsburgh Music History: One of the Great Singers of the 20th Century who put the “Ing” in Swing. (1999). Retrieved from https://sites.google.com/site/pittsburghmusichistory/pittsburgh-music-story/jazz/jazz—early-years/maxine-sullivan. 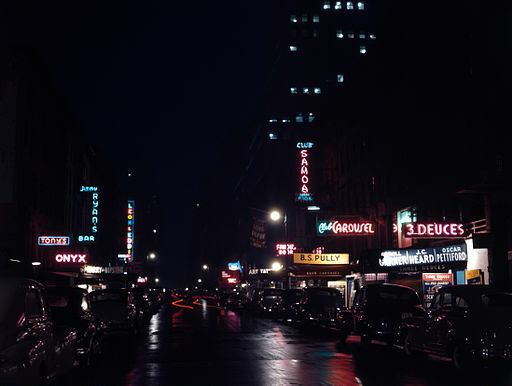 Lee Wiley: Night in Manhattan with Lee Wiley. Sony Music Special Products, KW75010. Al Hibbler Remembers The Big Songs of the Big Bands. Arrangements by Jack Pleis. Decca Records DL 78862. Friedwald, Will. The Legend by Will Friedwald (liner notes to “The Best of Frank Sinatra – The Capitol Years”) Capitol Masters Box Set C2/C4-94317. Welding, Pete. Sinatra’s Swinging Session!!! and more. (liner notes) Capitol Records CD – CDP7 465732. O’Day, Anita with Eells, George. High Times Hard Times. New York: Limelight Editions (Hal Leonard Corp), 1981, pages 228-232. This entry was posted in Duke Ellington, Uncategorized and tagged Jazz Singers, Jazz Songs and Performers. Bookmark the permalink.